A day long seminar on the universalisation of Roshni – the environmental initiative in practice in the President’s Estate was recently inaugurated by the President of India Smt. 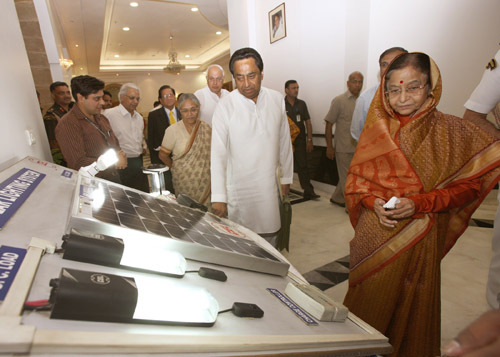 Pratibha Devisingh Patil at her state residence. The Roshni initiative, which was launched in 2008 has been an effort to help and equip the residents of the President’s Estate to live in harmony with nature. The initiative had then come against the background of issues concerned with climate change and is now working to make the overall environment of the President’s Estate more conducive and sustainable. Consequently, the Seminar was organized by the President’s Secretariat to gain a better understanding of this green initiative as well as to deliberate on how best to disseminate and replicate the concept and initiatives beyond the confines of the President’s Estate. About 300 participants took part in the Seminar which included delegates from the Ministries of Urban Development, New & Renewable Energy, Water Resources, and Environment and Forests, Vice-Chancellors of Central Universities, Directors of IITs and IIMs, officials from the Government of NCT of Delhi, Central Public Sector Units such as Power Trading Corporation of India Ltd., the Director General of SCOPE and other private companies as well as consultancies. The Seminar discussed the way forward for putting together the best practices followed by other gated communities in the country, so that this green innovation can be implemented more effectively and successfully in the future. As part of the Seminar proceedings, a website of the Roshni initiative was also launched which has information on the initiative including a video and photo gallery. After the day long Seminar, a decision to constitute a Task Force for greater and more effective universalisation of Roshni initiative was also taken. The hosting of such a Seminar by the President’s Estate is definitely a step forward for ensuring a sustainable urban development of the country as a whole. It is only time and the seriousness of this commitment on the part of the concerned authorities that will determine the success of the initiative. India’s rapid urbanization needs a sustainability reality check and perhaps the Roshni initiative will be able to do that.